A class action is a special kind of lawsuit in which a single individual, like yourself, or a small group of individuals are allowed to sue on behalf of other persons who have the same or similar claims. Class actions are particularly well suited to situations where many individuals suffer small amounts of damages and the facts of each claim are similar. How do I know whether I can bring a class action? Class actions are complicated, and you will need to consult with an attorney that specializes in class actions. Not only is this important so that you receive good advice, but the courts insist that plaintiffs be represented by attorneys experienced in class actions. Salehi & Associates has on staff highly experienced attorneys with decades of experience handling class actions. What types of class actions are there? Ad makes statement that is not true, such as that product will cause weight loss, cure disease, etc. Will it cost me anything to bring a class action? No. 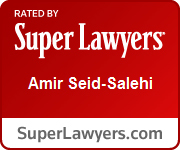 Salehi & Associates will bring the class and advance all of the costs of the litigation. You will not be liable for Salehi & Associates fees and costs unless the class action is successful.